On his new album, the sound that you might expect from Stefan Schwander`s Harmonious Thelonious alter ego (or from Stefan as a member of Salon Des Amateurs / Diskanted`s Durian Brothers (1)) – a fiercely percussive psychedelia of electronic future / past rites aimed at opening inner space portals – is only present on one track, “R.F.S (Vol. 3)”. 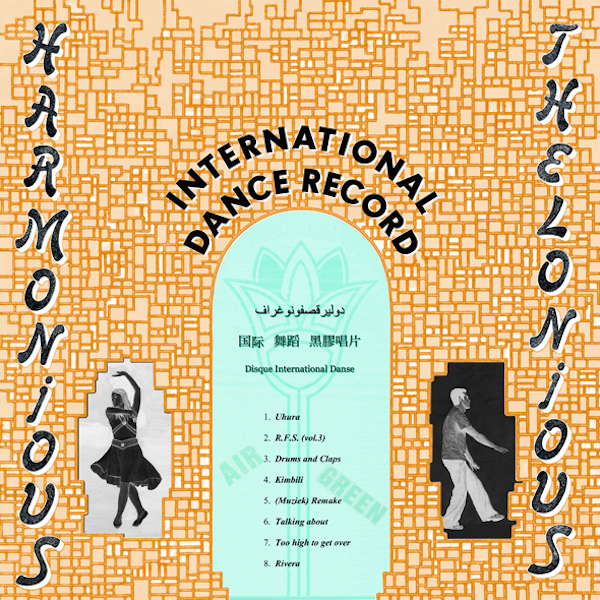 As suggested by its title, on “International Dance Record” the bulk of the music finds Harmonious off on holiday, and letting his hair down out on the floor. As if saying, “Yeah I do that, but I can do this as well.” Tunes like “Uhura”, “Drums & Claps”, “Muziek (Remake)”, and “Too High To Get Over” mix funky organ with clipped highlife guitar, tribal rhythms and sampled chants, referencing the Africa of Ben Cenac`s “Push / Pull” (2)(be sure to check Ben`s brilliant forthcoming Dream2Science remix of Kasra V`s “Myth” (3)), and the Warriors` Dance of Tony Addis (4), Mark Rogers, Leslie Lawrence, Keith Franklin, Kid Bachelor. “Confusion” (5) on Sundays, No Smoke`s “Koro Koro” (6), and Bang The Party`s “Bang Bang You`re Mine” (7). The House “Division” of Soul II Soul`s “A happy face, a thumpin’ bass, for a lovin’ race”, “Steady, are you ready”. “Talking About” adds chords not unlike those on Logic`s classic, “The Warning” (8). “Kimbili” synthesises playful Electro around a thumbed kalimba. Konono #1 on a beach (9). The closer, “Rivera”, falls somewhere between the Art and the House. A gentle heat-enervated trombone-serenaded calm, that`d go really well with Juan Marco (10) or Chaos In The CBD`s “Global Erosion” (11).